Holiday time can be fun, but so very expensive and consequently stressful. Amidst the frantic schedules we keep all year long, the extra tasks thrown in for the holidays and all those expectations, sometimes we are just glad when it is all over. Hopefully you will have time to slow down, take a breath and enjoy some of the seasonal pleasures – which can be awesome with the right attitude, a little bit of sleep and time to stay in the moment. Here are a few ideas for the holidays, which hopefully will help you save money, time and reduce those stress levels! Use nature – cut cedar or pine boughs from your yard or from a friendly farm nearby (ask first for heavens sake!). Tie them into garlands and fill the house with greenery and good smells. I fill vases with cedar boughs and tie a red ribbon around the vase for centerpieces. I cut down a small cedar tree (which grow like weeds on our 6 acres) each year, put it in a tree stand on the porch and put white twinkle lights on it. Just bare twigs in a large vase, with old ornaments tied to them can be pretty as well. We live on the edge of the prairie and prairie grasses grow well here. In the fall, after first frost, I pick interesting looking grasses, with seed heads intact and bunch them into 4” wide 12 “ tall stand up decorations – just by tying a Christmas ribbon around them in the middle. These make nice gifts too. They kind of look like the ones for sale at Curious Country Creations. Plan ahead and hit garage sales, but especially estate sales. You can pick up beautiful decorations, wreaths, linens, trees and more at these sales. Thrift stores are also a great place to shop. I went to one today and saw brand new finger towels with trees and Santas on them for $3 a set. There was a foot long reclining reindeer for the table or dresser for $6. I find lots of Christmas ribbon and bows at these sales as well – the 3 or 4 inch wide gold trimmed fabric kind of stuff for prices like 75 cents for the entire roll (which will cost you at least $10 a roll brand new). Reuse your own decorations. We have some shiny red plastic ornaments that no longer fit on the tree, so I put them into a cut glass vase (that yes, I got at an estate sale) in our entry way. Other treasured items we reuse every year include huge a mottled green glass ball ornament from my grandparents, a set of 1950’s angel candle holders from a favorite aunt and two 3 foot tall paper nutcrackers made by my kids in elementary school in the 1980’s. It’s expensive to entertain – especially if it includes a meal or alcohol. Plan your entertainment budget ahead of time, and include those gifts that we all should bring to a party if hosted by someone else and we attend. For family dinners, have everyone bring a dish, or better yet, do a traveling dinner. Start at one house for appetizers, then move on to another for soups and salads and yet another for entrees and a final one for deserts and drinks. Our extended family get togethers always involve folks bringing their own favorite alcohol as well as a specific dish for the meal. If you are providing all of the food, plan your menu to take advantage of less expensive and seasonal foods – and don’t over serve. Heaven knows, not many of us lack for food or sustenance! Instead of expensive cheese and meat appetizers, serve low calorie and healthy vegetables and fruits. A simple lettuce salad with an special dressing, or perhaps a squash soup could suffice for the first course. A meat and two vegetables is plenty for an entree – especially when served with a bread and gravy. I always prepare way too much food and really need to get a handle on not doing that. It helps guests over indulge, is expensive and wasteful – because a lot just gets thrown out when it starts to go bad. Our family’s latest new tradition is to have a post holiday gathering where we only serve soup. We bring gag gifts and play games instead of doing a regular gift exchange. The main purpose is just to enjoy each others company! In my growing up family, we didn’t get that many presents on Christmas day. Our tradition was to stretch out the gift giving and opening. Instead of the kids running in and ripping into presents one right after another, only one person at a time opened one gift. Everyone looked at it and talked about it’s significance and a picture was always snapped. Then the next person got their turn and so on around the room. The giver feels much more appreciated when time is taken to examine and hear about the gift, than if it is immediately dropped on the floor to rip open the next one. Buy a big roll of brown paper at Lowes or Home Depot and use it to wrap gifts. You can get 144 feet of 2+ feet wide paper for around $11. Kids can provide artwork, or you can just tie the packages with natural twine and put the picture from one of last years Christmas cards received on it. I wrap loaves of homemade bread in aluminum foil and tie a bow around the middle for a special gift to close friends and relatives. Of course, you could do what my aunt used to do, and save paper from one Christmas to the next!! Can you tell she was raised in the Depression Era? When I worked, we used to attend the city symphony’s Christmas family performance. Tickets were quite expensive, but my company paid half. It was a great show. Now that we are retired, we find free Christmas concerts and orchestra performances to attend. It turns out there are quite a few symphonies in a large metro area and many are quite good! There are typically many free holiday events from which to choose. Depending on where you are, you will find tree lighting ceremonies, visits with Santa, fireworks, gingerbread villages to view, and many holiday drives to show off outdoor lighting. Many areas have free activities for the kiddlies as well, such as shopping center train rides, downtown mall activity centers, volunteer run kid only shopping expeditions or special zoo events. Inexpensive winter activities are also plentiful. Ice skating at the local outdoor rink, tours of homes, both new and historic, zoo events, heritage park demonstrations of holidays in years gone by, stores offering in-store activities (check out Bass Pro Shops or toy stores or your cities fanciest shopping area to find these). 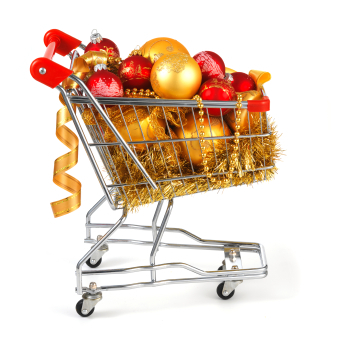 What are your favorite holiday super saver ideas? We like to do potlucks to bring the cost down. It makes it easier for everyone and it’s cheaper as well. We’ve got a bunch of family visiting us this year, so we’re looking for ways to not spend an arm and a leg on food for while they’re here. Christmas decorations are so so expensive!! We are buying nice ones that will last for years to come and avoiding the cheap rubbish that is for sale at some supermarkets! We have a mix. We bought some years ago at Kmart that we still use, and then there are the collectible ones…. I don’t like secret santa because you always get something you don’t need in the first place, so unless it is edible, I regift to the next secret santa. At least you can find a use for unwanted gifts and have the fun of the gathering. We told our kids that Santa doesn’t wrap presents – so everything “he” brings to them comes unwrapped. It saves us big!